Lines out all day...result two fish! These cats eat up the miles - 200 nm in 24 hours! 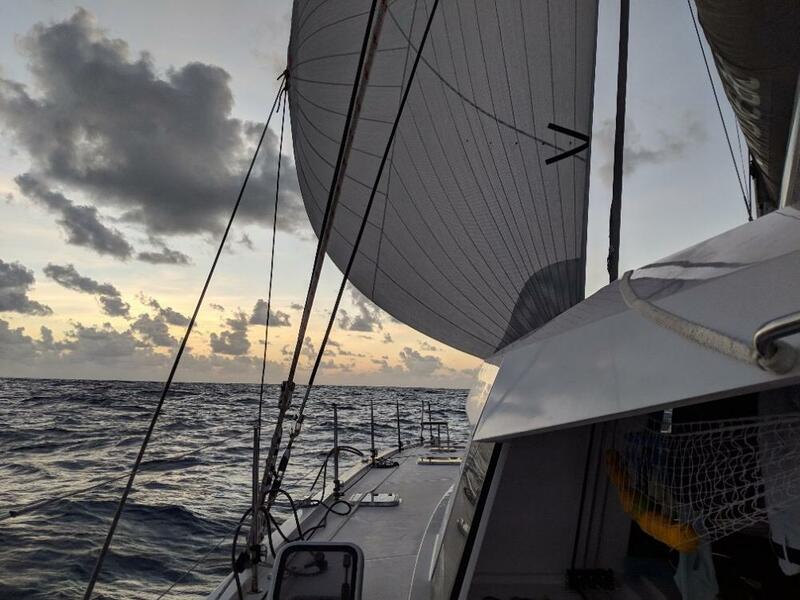 It feels as if we are now in the final stretch, it's 0200 at the moment on Sunday morning, we have just under 300 miles to go and the first boat (Nika, a beautiful £2m+ sixty-five foot performance monohull) has crossed the line a little earlier this evening. We should finish on Monday, it looks as if we'll be second multihull to cross the line (although the first cat motored a lot on the first day they have sailed very well). It's a shame we had so many sail problems earlier in the week, these probably cost us around 60 miles...but it's a rally! Today we had chafe in our spinnaker halliard again, it took about an hour to sort out and we've run out of rope to shorten it. If it goes again, we've run out of options and will finish on main and jib only. Next time (!) we'll have to find a way to have two spinnaker halliards. We've now got a small list of potential improvements for the boat, even though we were well prepared. We are looking forward to our first rum punch ashore but I doubt we'll be able to eat much better than in our restaurant on board. On Friday we realised we were seeing increased amounts of Sargasso weed in the sea; we are very much on the southern extreme of the Sargasso Sea, it's centre is several hundred miles north of us and is a gyre, surrounded by four ocean currents spinning clockwise including the Gulf Stream to the east and the Northern Equatorial Current, which we are riding, to the south. In this region this very important weed grows and forms streaks and clumps in the water. Although it's seen as a problem when it hits tourist beaches (and more is forming as the seas heat up through global warming), it's vital for sea life providing protection for young fish, eels and turtles. (Thanks to Sarah for the research!). As we passed through some patches of weed we suddenly realised that it might be a chance for our fishing to improve. We've had lines out each time the weather moderated,; we hooked a large fish on Thursday but lost it; our line broke and we lost a lure again on Friday afternoon. This time however I was letting out the line out, about 80 metres behind the boat, when I saw a streak of foam rush across, leap out of the water and take the lure. Less than 3 minutes and we'd hooked a fish, brilliant(! 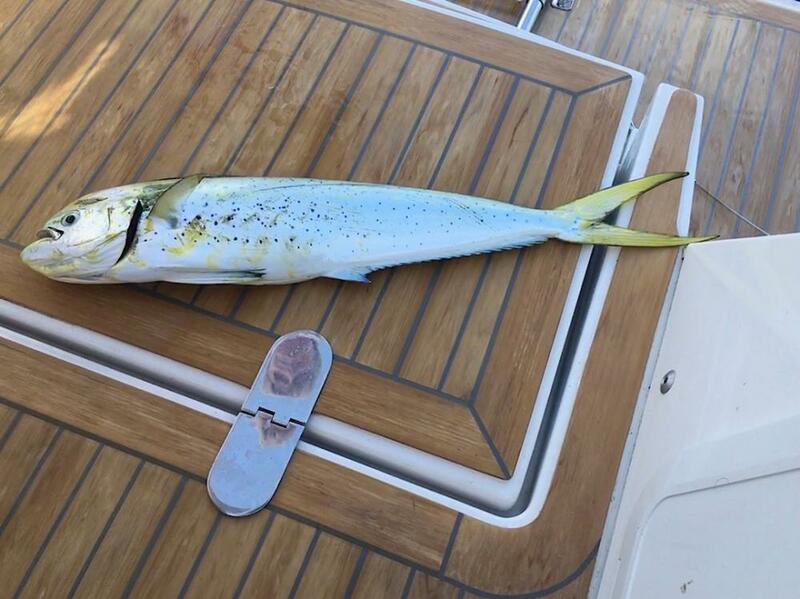 ), except we were sailing at 9kts and the drag was crazy. The line ran out at speed and it was all hands on deck. 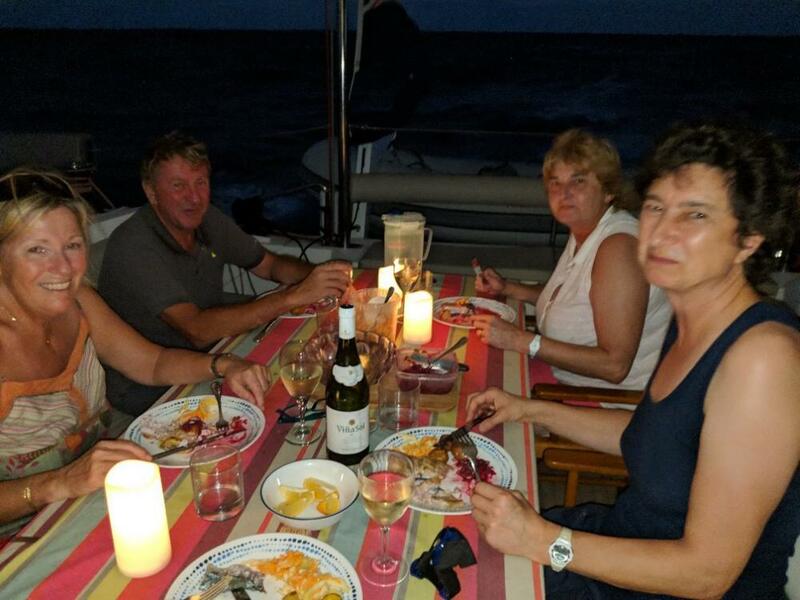 Fortunately our squall practice has helped and, after about 5 minutes, Mike, Lucy, Sarah and Anne-Laure had managed to furl the code zero to slow the boat whilst I hung onto the fish. 20 minutes later we'd landed a small 3kg Mahi-Mahi, which we'd dispatched humanely and quickly and had been filleted on the back of the boat. Change of plans for dinner! 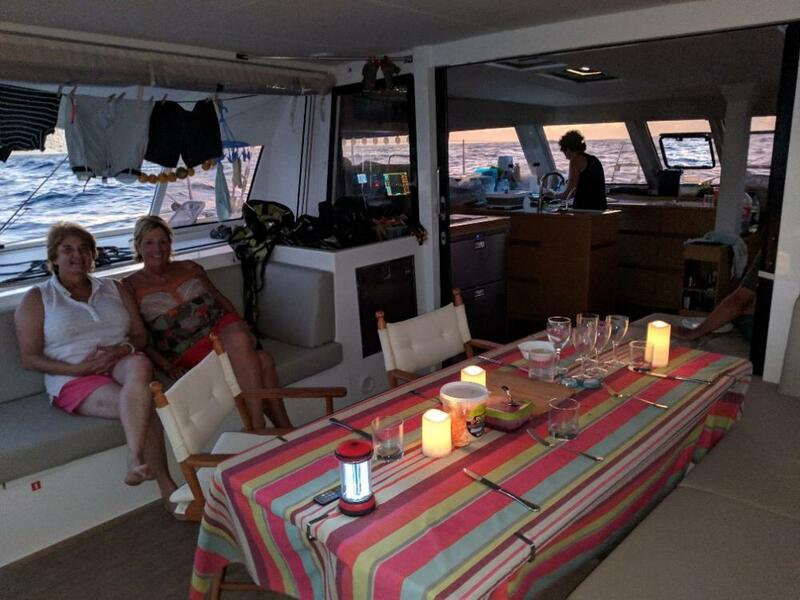 We decided to make Friday night special, we were romping along in a slight to moderate sea, the sun was setting; time to lay the table and bring out candles. The menu? 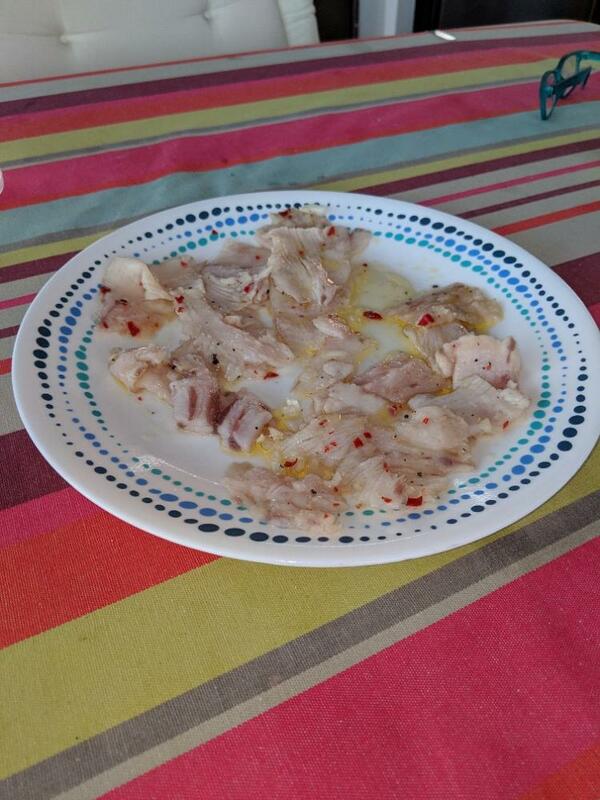 Ceviche for starters (Mahi-Mahi strips marinated in lime juice and chillies) with a single, very light, G&T (Sarah under careful supervision!) followed by the Mahi-Mahi fillets with crudités and roasted new potatoes, accompanied by a nice bottle of white wine. Ok so we confess, it's not difficult out here all of the time! !